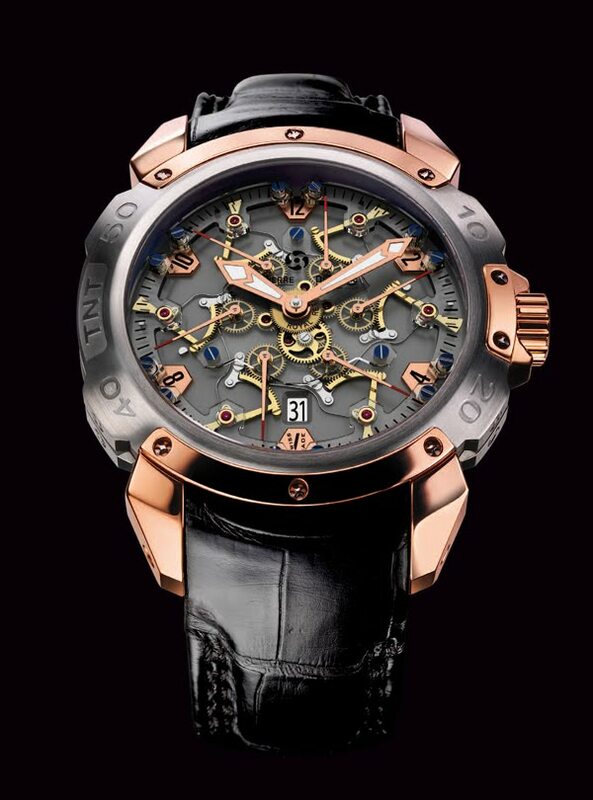 In 2009, Pierre DeRoche introduced a world first with the launch of the TNT Royal Retro and its six retrograde seconds mechanisms. This watch made a significant impact, and three years later, the brand boldly presents its star model with seven visible sapphire bridges. The now entirely transparent movement unveils yet more of its mysteries, further revealing the originality of its spectacular complication. The association of sapphire and titanium, two extraordinarily hard materials, gives a whole new expression to the TNT Royal Retro Sapphire. Refined, flowing and crystal-clear, as well as sleek, masculine and sporty: in short, the perfect blend of delicacy and strength. 11-piece limited edition. 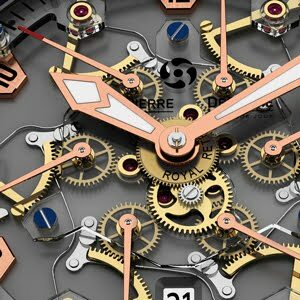 Automatic, exclusive Dubois Dépraz calibre, 58 jewels, 22K pink gold decorated and engraved oscillating weight, central bridge with 12 pivots and 6 sapphire seconds bridges, 6 retrograde seconds hands on gears, strip-springs return.